Completes forensic engineers utilizes specialized equipment including a fleet of drone mounted thermal imaging to ensure that we catalog each and every issue correctly for a property or a hundred. Our team undergoes regular training on equipment and techniques. We pair this knowledge with our deep understanding of construction methods and experience with multiple building technologies to provide a comprehensive solution to moisture issues. 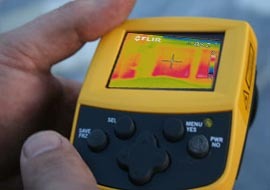 Picture of a thermal image showing hot and cold areas in an attic. 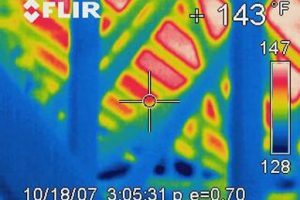 We regularly employ Flir Thermal Imaging Cameras, GE Protimeters and Tramex wall and roof scanning equipment to get to the heart of the problem. By utilizing these advanced technologies to scan entire roofs and even whole buildings, we often can reveal the scope and extent of a problem before it leads to additional losses. By using non-destructive scanning and imaging techniques, we can identify where moisture entered the envelope, how far it has spread, and where it has not. Know that when you call Complete to assess the problem, we will do a thorough job and leave no stone unturned. We stand behind our people, our knowledge of modern equipment and our commitment to do the job the right way, every time. We stay up to date with continual training and have a deep understanding of why buildings fail both from our own experience, peer reviewed science and proven methodologies.